Ad Location-The location of an ad is super important as well. There are 2 major locations, and then there are several less important locations. 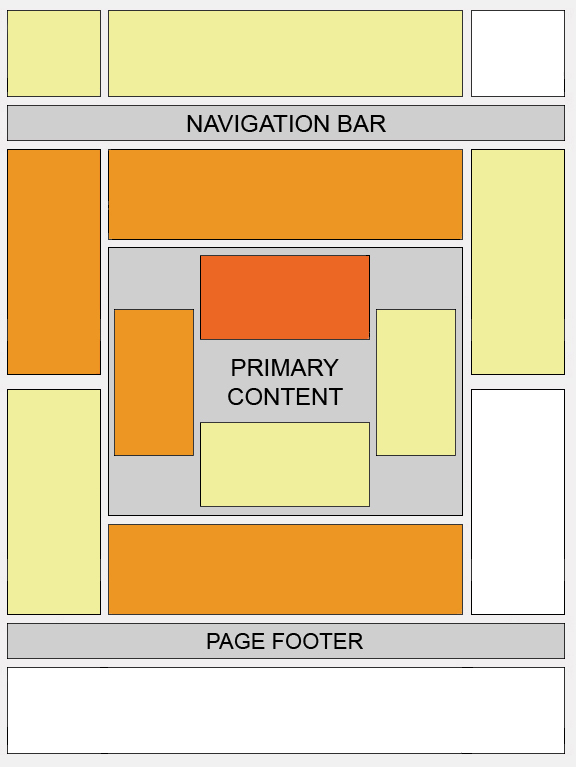 Above the Fold-ads above the fold are above the bottom of the standard 1024×768 or 800×600 screen resolution bottom. This is an old term that has been retained from old print media advertisements. Items above the fold, would be above the fold of the paper. These ads have a much higher ctr than the ones below the fold. Below the Fold- same thing as above. Ads below the fold are below the standard 1024×768 page start. These ads have a much lower CTR. There are also hot spots within pages. Areas that persons are most likely to focus there attention, and therefore most likely to see and click an ad. Google has done a great job outlining these areas using something of a “adsense heat map”. Here is the image. Please click it if you want to enlarge it. Most people will be surprised to see that the header region is not a hot spot. This is a very low ctr space because it has been historically used for ads in the past. People pass this area by almost automatically. You can also see that the middle center of your page is the hottest of the hot. While this is true, i rarely use it because it makes my pages look ugly. I personally like my main ads to be just left or right of that area. This leaves room for page content to the left or right, and place the ad side by side with the content. #1 Ad Placement Tip-Super duper ultra important, and maybe the most important tip, is to blend your ads. By blending we mean wrap the text around the ad. Bloggers and webmasters can do this by using the float command. Floating an ad left means that the ad will be on the left, and the content will “wrap” around the ad space. Floating an ad to the right means the content will “wrap” around the left side of the advert. #2 Ad Placement Tip- If you are a blogger or webmaster, then place the ad directly under the first <h1>, <h2>, or <h3> tag on your page. Placing ads under headings boost the ctr as well as the contextual nature of the ad do to its relevancy to the page topic. Ad Color– the ad color is very important when it comes to blending your ads apperance with the content of your site. Using a border and background color that match eachother, as well as match the bg of the area they are implemented is important. You want to make the Ad Titles, and Urls stick out as well. Try matching these with the color of your current links, if this still yields lower than expected click through rates then try other colors that might grab users attention. Most importantly, keep trying untill you are happy with both the appearance and the results. Image or Text -Image ads almost always have a much lower ctr than text ads. This is the opposite of what you would think right? Well time and time again people will pick a text link over an image ad. Not sure why, may have something to do with the ad blindness again. Text ads tend to look more organic and enticing. So with that last joke we are going to sum up this article. Bookmark this page, and come back when you need a refresher. We’ve spent years figuring and re-figuring ctr increasing techniques, and while this is not the “bible” on this topic it is indeed a great resource. One note to persons out there. If you happen to stumble upon someone saying that It’s a good idea to put images next to your ads, with the purpose of increasing your ctr, don’t listen to them. It’s against the adsense tos, and will get you shut down. It may work for a few months, or weeks but you’ll get burned soon enough. Thanks for reading please post any and all comments below, we want to hear from you. This entry was tagged adsense clickthrough help, adsense clickthrough tips, adsense cpm, adsense ctr tip, adsense ctr tips, adsense earning tips, adsense top tips, best adsense ctr tips, best adsense tips, boost adsense ctr, help boosting adsense ctr, help increasing adsense ctr, hot to increasing adsense profit, increase adsense, increase adsense ctr, increase adsense ecpm, increase adsense revenue, increase google adsense ctr, increasing adsense profit, tips on increasing adsense ads, tips on increasing adsense cpm, tips on increasing adsense ctr, tips on increasing adsense revenue by pagestat. Bookmark the permalink.